The History Channel tackled the entire Bible earlier this year, but acclaimed director Darren Aronofsky is zeroing in on one story in particular. The "Black Swan" helmer has taken a dive into the tale of Noah and the Ark, and has come up on the other side with a dramatic action film. In addition to directing the project, Aronofsky also wrote the screenplay, and the first trailer for the film depicts Noah first having disturbing visions of the destruction that awaits, and then accepting his challenge with steely resolve. Russell Crowe portrays the Biblical figure in the upcoming release, which also stars Jennifer Connelly, Emma Watson, and Anthony Hopkins as Methusulah. 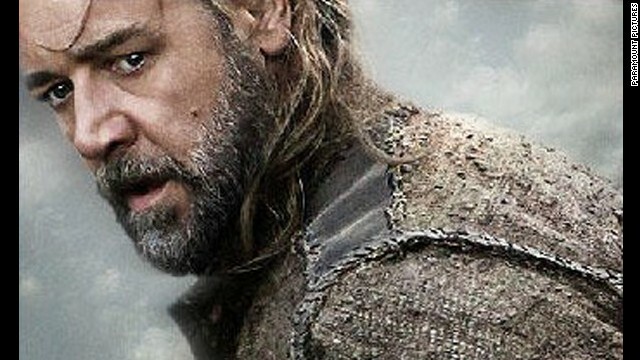 Scheduled to arrive on March 28, 2014, "Noah" isn't the only movie in the works about a Biblical hero. Ridley Scott's "Exodus," slated for December 2014, stars Christian Bale as Moses. Looks good. Love his work. Noah looks like a homicidal maniac on a killing spree in that promotional still. He looks like maximus general of the armies of the north entering the arena in biblical garb. I'm looking forward to an explanation of how he aged to 950 years old and could find breeding pairs of all species that long ago when that cannot easily be accomplished today. Dude. First, all the land was connected back then. 1 big continent. Second, he had Jahweh's help. He probably had some power like Aquaman where he could summon the animals telepathically. Third, people lived longer back then cuz ALL the food was natural and organic, and there was no environmental pollution. Pangea existed and the separated millions of years before Noah. So, no the continents were not connected. There are 10,000,000,000 species on earth. Even with todays technology you could not build a boat out of wood that would be large enough to carry two of every species, and not sink. Even if you could, it would take one person thousands of years to complete it. It would need to be hundreds of times larger than any vessel ever built by man. Anyone who believes in the Noah fable is a complete and total moron. Of course it's not possible if you leave out God. Anyone who believes derp is the real moron. Derp, you are really wound too tight for your own good. Where's your sense of humor? Joke, son, I say, it's a joke. Lighten up. Every Sunday I pray at His altar in The Church of derp. Otherwise known as stall #1, men's room, Greyhound bus station, NJ turnpike. Free mouthwash at the glory hole. Sorry tyuiop, it is nearly impossible to tell the difference between insane sarcasm, or religious nutters. They both sound the same. "Of course it's not possible if you leave out God"
So the magic sky fairy somehow managed to build a boat out of wood, that would have to be half the size of Texas, and found a way to make it float? I thought Noah built it (which is physically impossible). Please elaborate, was it magic sky dude or was it Noah who build this superboat capable of housing 10,000,000,000 pairs of animals for 40 days? You do realize that that there were no tress in Israel large enough to even consider making that size vessel out of. You do realize that even today, there is no process of boat building that could create a wooden vessel large enough to hold that many animals and not flex to the point of sinking. What, did the magic sky fairy grow some super big cross between redwoods and rubber tress that never existed before or since, cut them down, and then help Noah build a ship that is still not possible to build using modern materials, engineering and tools. Maybe sky wizard boy just waved his magic god wand and whipped up a boat 100 times bigger than anything ever made by man before or since. Are religious nuts really this stupid? You seem to be obsessed with this mythical NJ turnpike glory hole, or at least know more about it than your average bear. Perhaps you've done some time there, as an attendant? That would explain your dirty knees. Yes. Yes they are that stupid and they will prove it shortly with their inevitable, far-fetched, hackneyed responses. The joke will be on you. Laugh now, while you can. "...and could find breeding pairs of all species ..."
Noah took KINDS, not species. The ark was bigger on the inside than the outside, just like the Tardis. Have you no imagination? Why did Noah have to save the mosquitoes? That was a bad move. You are going to troll me when I'm deleting trolls off right and left. lmao, that was some bad timing on your part. Still getting under your skin, I see. Not quite the Zen master you imagine yourself to be. Fail. Again. Personally , I'm disappointed that Roman Polanski's planned live action version of The Little Drummer Boy never got off the ground. It was to have featured Keith Moon in the lead role. Can't wait for Aronofsky's take on Jonah and the Whale. I hear they're planning to use a real whale, and working in conjunction with Sea World. Also can't wait for George Romero's horror version of Jesus and Lazurus. Should be pretty darn good.